Our friend Robert told me a couple of years ago that he didn’t think he could stand spending another winter in the Boston area. He was simply not constituted for the relentless cold. 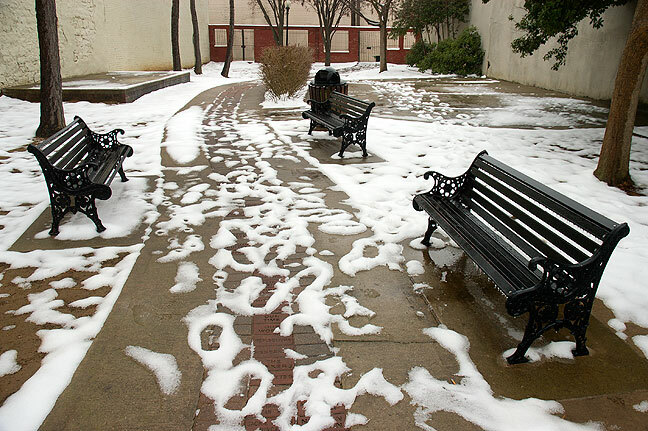 He moved to a metroplex of warmer clime, but I thought of his comments several times this winter, and especially this week, when, unlike our usual Oklahoma winters that feature short, sharp cold spells that warm up quickly, it has been bone-achingly cold for weeks. There is a pall of thin, dry snow on the ground, and the wind has taken my breath away every time I step outside. I like the cold. I like snow. But somehow, this winter has been more than cold. This is a scene from Central Park in Ada, Oklahoma. In your mind, picture Ali MacGraw and Ryan O’Neal on one of the benches. It is definitely frigid. Which in my mind is a combined word of frozen+rigid. As in frozen stiff and stiff as in corpse. This winter weather reminds us with every step that we are mortal. There is no casual stroll in the park. We layer on our protections, watch our every step and feel and see our every breath. If I had a love story take place in Cambridge I perhaps could have choosen the the cold. This winter certainly has me glad that I moved six hours further south. It’s colder than usual here too, but nothing compared to what you have seen.